The Historic Tapoco Lodge was built in 1930 by the Aluminum Company of America as part of hydroelectric efforts in Graham and Swain counties of North Carolina. The name Tapoco comes from the first two letters of the Tallassee Power Company which began construction of the Cheoah Dam in 1916. 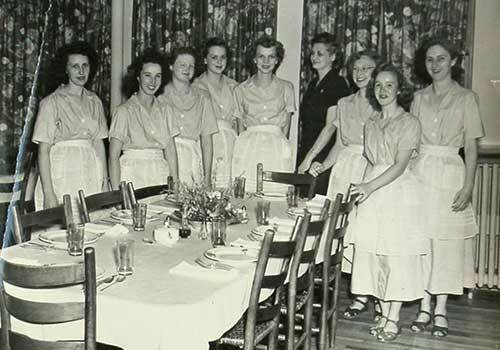 For the next few decades, the Lodge was used primarily for company functions. The Cody Family of Robbinsville, North Carolina re-opened the Lodge to the public in June of 1995. Ronnie and Terry Hedrick purchased the property from the Codys in 2010 and made significant upgrades while maintaining the historical integrity of the lodge, which is proudly on the National Register of Historic Places. In 2017, the Bailey family (Adrian, Mary, Kevin, and Connie) took over ownership of the lodge and it continues to undergo restoration and modernization. The Lodge and extensive grounds are open to the public to explore and enjoy. 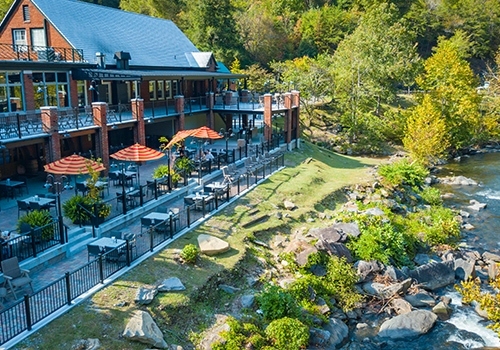 Nestled in the midst of the Great Smoky Mountains and the Nantahala National Forest, the Historic Tapoco Lodge encompasses 120+/- acres running along the Cheoah River. This property has everything you will need on site for a relaxing vacation retreat. Equipped with 9 elegantly furnished rooms/suites in the main lodge and 18 cabin rooms, the Historic Tapoco Lodge features two on-site restaurants. The Tapoco Tavern is the perfect place to gather a group of friends for game day parties. The Tavern includes a bar and wood stone pizza oven. The Historic Tapoco Lodge has an incredible storied past, much of which has been maintained through its recent renovations. The property was home to the town of Tapoco, founded in 1913, to provide housing for the hundreds of workers constructing the hydroelectric dams. The Tapoco Tin Movie House has been restored to its glory days when it was also used as a community center, dance hall, and for going away parties for the many local soldiers during World War II. When you do feel the need to venture out, the nation’s most popular playground is at your fingertips in the Great Smoky Mountains. The Historic Tapoco Lodge is minutes from The Tail of the Dragon, an 11-mile mountain road famous for its staggering 318 curves. This, of course, makes both The Tail of the Dragon and the Historic Tapoco Lodge an obvious choice for motorcyclists, sports car drivers and two-lane tourists from all over the world. With hiking, canoeing, rafting, kayaking, fishing, mountain biking, and so much more just out your doorstep, the Historic Tapoco Lodge is truly a piece of history amidst nature’s playground. Adventuary – Where adventure meets sanctuary!